The horse world has not proven resistant to the obesity epidemic and related diseases that have swept our human population. Every day in my practice I see animals that are overweight or over-conditioned, conditions that put them at risk for a variety of long-term and debilitating diseases. 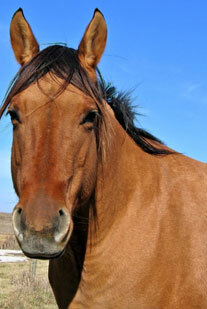 Many of these animals might now be diagnosed with Equine Metabolic Syndrome (EMS). EMS is a likely diagnosis for overweight animals, animals prone to laminitis, animals with “cresty” necks or other exaggerated fat pads, and animals with elevated fasting insulin levels. Just as in humans, these elevated insulin levels are of particular concern. This key hormone is responsible for sugar and energy metabolism in the body, and high fasting levels suggests that the body is not responding to insulin. The result is that metabolism controlled by insulin isn’t working optimally, which in people can lead to diabetes. While the impact of elevated insulin levels on the horse is still being studied, likely consequences, based on information from other species, include inflammation and circulatory issues. Without a doubt, exercise and diet modification play a central role in the management of EMS. I use this treatment wherever possible. Unfortunately, this practice doesn’t fit many situations. Whether due to lameness, a challenging barn environment, inactivity due to cold weather or something else, diet and exercise are often not enough. With more and more animals being diagnosed with EMS, finding other management tools is becoming a priority for the veterinarian, trainer and owner alike. So what other interventions are worth considering? Companies are beginning to supply feed, supplements and pharmaceuticals targeting EMS, though weeding the good from the bad remains a challenge. How does one pick a safe and effective product/protocol among this growing list? I didn’t have much confidence in supplements and didn’t have much experience using them until I had the opportunity to participate in a clinical evaluation of a supplement now on the market. In 2007, I was approached by a dietary supplement company about the possibility of evaluating a food-based nutritional supplement for EMS animals. This seemed like the perfect opportunity to get up to speed on what was going on with EMS and to assess how good some of these management tools might be. My first step was to meet with the company’s research team to understand the product background and ingredient rationale. Almost all the data available about the product ingredients were from studies conducted in the lab or in other animals. Despite this, the ingredients had historical use in the horse (safety) and were modest in dose (safety), and the data in other species made sense (efficacy). After reviewing the product ingredients I was particularly interested in the approach taken to influence metabolism. For example, one of the ingredients was buckwheat flour, which contains a variety of compounds called flavonoids. These plant chemicals may compete with sugars for uptake into the body and effectively slow the absorption of sugar and lessen the post-meal glucose and insulin surge. There is also evidence that one of the major flavonoids in buckwheat, rutin, helps to maintain capillary integrity, which may help in animals prone to laminitis. It was this multi-targeted approach that particularly intrigued me about this product and rang true with the recent literature on EMS–it is not a single system problem. Having satisfied myself that there was low risk (historical use of ingredients, dosing levels and available monitoring tools) and significant treatment opportunity, the next step was to test it in several animals. I selected four animals with classic signs of EMS–elevated fasting insulin, cresty necks, high body score–and put animals on the product. I ran baseline CBC and blood chemistry to have some assessment of safety. Diet and exercise recommendations were also made. Lab tests were paid for by the company, though in retrospect the amount of money spent would have been well worth it for the practice to cover to be able to make good clinical choices. Follow-up tests were run four weeks later. Blood measures were unchanged while insulin levels had dropped dramatically. The animals didn’t look any different, so whether this one physiological measure had any long-term meaning remained to be determined. I was surprised enough by the result to consider the product for further evaluation. In essence I was at the stage of having an apparently safe product with significant possibility of therapeutic benefit and would continue to monitor animals taking the product. I had, after all, made recommendations for changes in diet and exercise that could contribute to the outcome (although physical changes might have been observed) so more monitoring was necessary. I was fortunate enough to participate in a broader evaluation of the product sponsored by the company, and eventually my practice evaluated 29 animals who took the product for four months. In the end, 20 animals decreased their fasting insulin levels over the course of supplementation and three animals increased circulating insulin levels. The others had variable responses in insulin levels. During this time the attending veterinarians along with owners participated in the evaluation of observed physical changes in these animals. The company reported that both the attending vets and owners found improvements in physical conditions such as “cresty” neck, overall obesity, laminitis, activity and quality of life. However, the most compelling evidence was my own anecdotal experience. Animals who improved tremendously who I knew didn’t have other interventions or those that went off treatment, regressed, resumed treatment and improved. Though the larger scale evaluation was sponsored by a company, the principles can be applied on a smaller scale and can allow a greater comfort level in making recommendations to clients. The end result in my case was a reasonable clinical evaluation of a potentially valuable tool to support EMS. Richard C. Tully, DVM, practices with six other veterinarians at Elkhorn Veterinary Clinic in Elkhorn, Wis. He earned his DVM degree from Ohio State University in 1978. Dr. Tully’s article “Severe Hypoglycemia Attributable to Surreptitious Injection of Insulin in a Mare” was published in the July 15, 1988, Journal of the AVMA.